Royal Caribbean offered travel agents an official status update on the new Royal Caribbean app for smart phones. Royal Caribbean says the new app is already available on Symphony of the Seas and Allure of the Seas, and "currently being tested on other select ships." The capabilities of the app vary from ship to ship and new functions will be "rolling out across the fleet throughout the year." 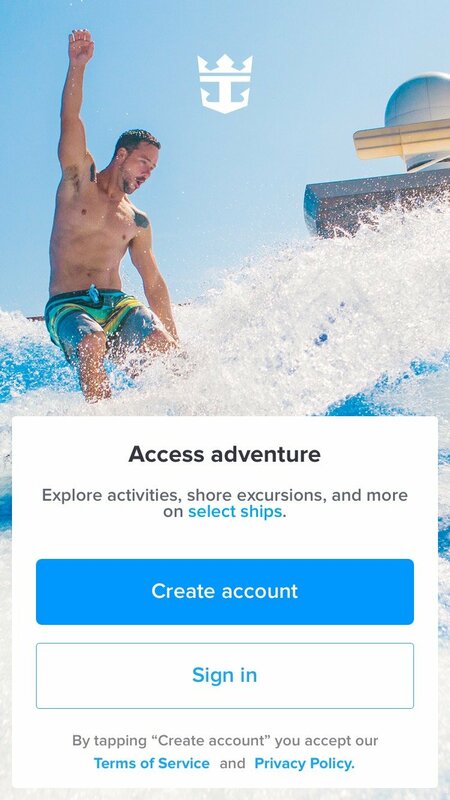 The app takes advantage of the new Universal Guest Account, which was rolled out to, "deliver many capabilities of our digital cruise experience, to simplify the guest experience online and to allow guests to quickly access features and information." Royal Caribbean has released a new update to its smart phone app, which primarily adds support for use on Symphony of the Seas. Version 1.6.0 of the Royal Caribbean app was released to fix bugs, improve performance and also be compatible with Symphony of the Seas. 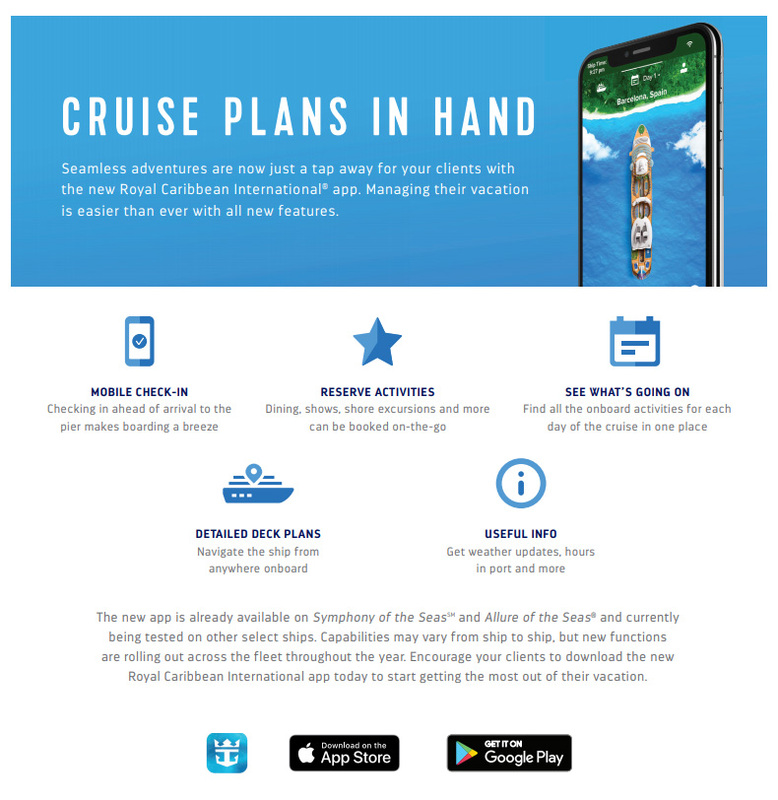 Royal Caribbean's new smart phone app has been updated to include support for Serenade of the Seas. 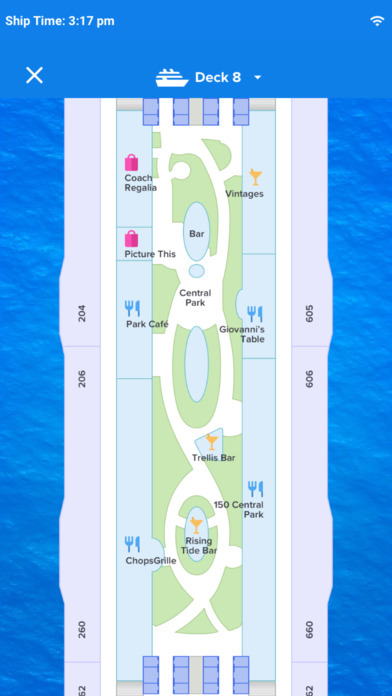 Version 1.3.0 of the Royal Caribbean App was released, which expands functionality and makes it work on Serenade of the Seas, in addition to Oasis of the Seas and Allure of the Seas. Royal Caribbean made big headlines with their recent tech announcement that will usher in a new generation of smart technology to enhance the guest experience. At the heart of this new initiative is a brand new smart phone app that the company has been working on in earnest to provide a seamless experience online. The new app is packed with features, and we picked our six important ones you should be aware of before using it. With the new app, guests can see exactly where their luggage is on embarkation day to know precisely when it has been delivered to their stateroom. This feature means you do not have to play the game of walking back to your room on a number of occasions to see if luggage has been delivered. Instead, simply open the app and follow the luggage's status, just like you would a package in the mail. From the palm of your hand, you can manage your shore excursions and dining reservations onboard your Royal Caribbean ship. This is great for when you are at the pool, breakfast table, or milling about in your stateroom and have your family around to make a decision. Open the app, select the option you want and you are all set. 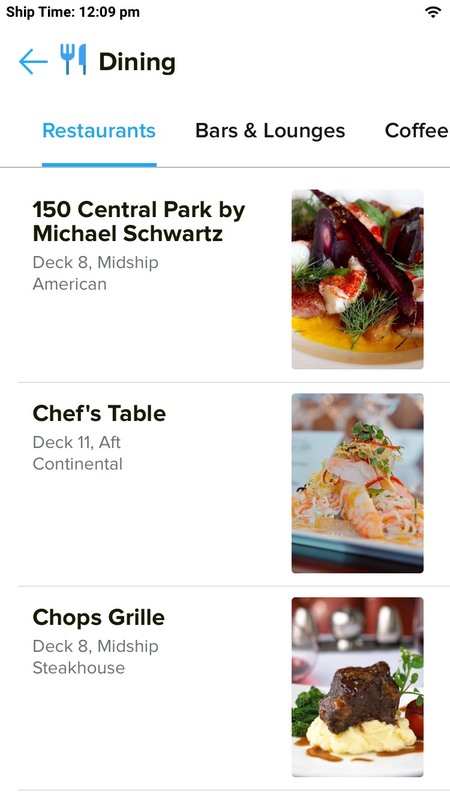 The new app means guests can quickly manage their onboard and on shore plans without making a trip to Guest Services, or anywhere else onboard. This means less lines to wait in, and no restaurant phone extensions to look up. A really common question we get asked is how to stay in contact with friends and family on a Royal Caribbean ship. The new Royal Caribbean app will allow for easy text communication, and no internet plan is required. 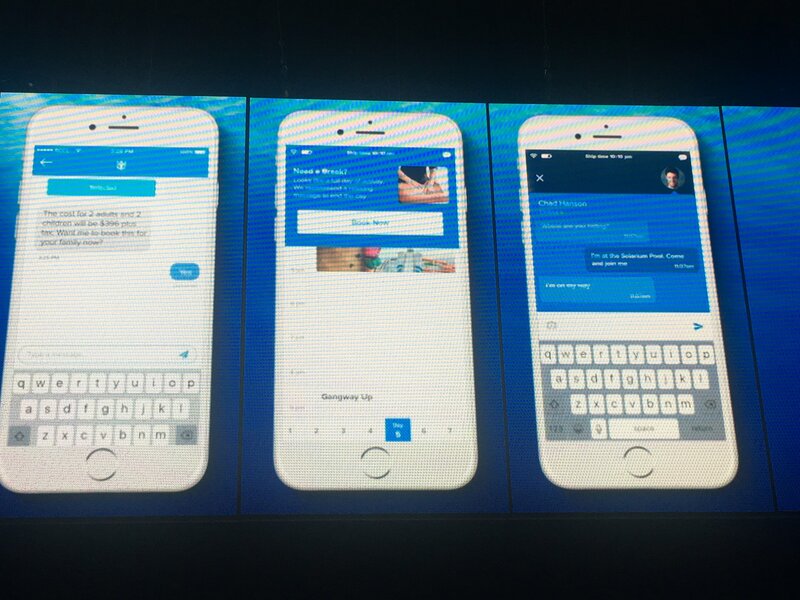 Unlike Royal Caribbean's previous smart phone app, Royal iQ, there is no additional cost to use the texting feature in the app. This means everyone can easily communicate onboard and synch up. Carrying around a paper copy of all of the events and remembering to pack a highlighter is so twentieth century. 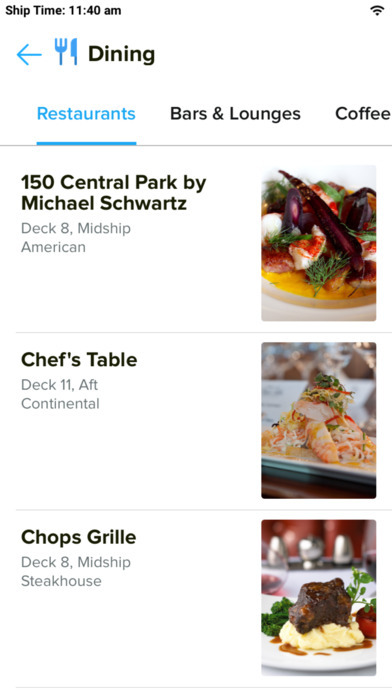 With Royal Caribbean's app, you can easily see what events and activities are occurring onboard. Moreover, you can add any Cruise Compass entry to your own personal calendar, so you never forget which events you wanted to check out. Royal Caribbean wants to streamline the check-in process to the point that it is as simple as walking in. Forget the forms to fill out, pictures to take, or agents to speak with. The new app will allow for a "frictionless check-in" that gets you onboard your ship very quickly. 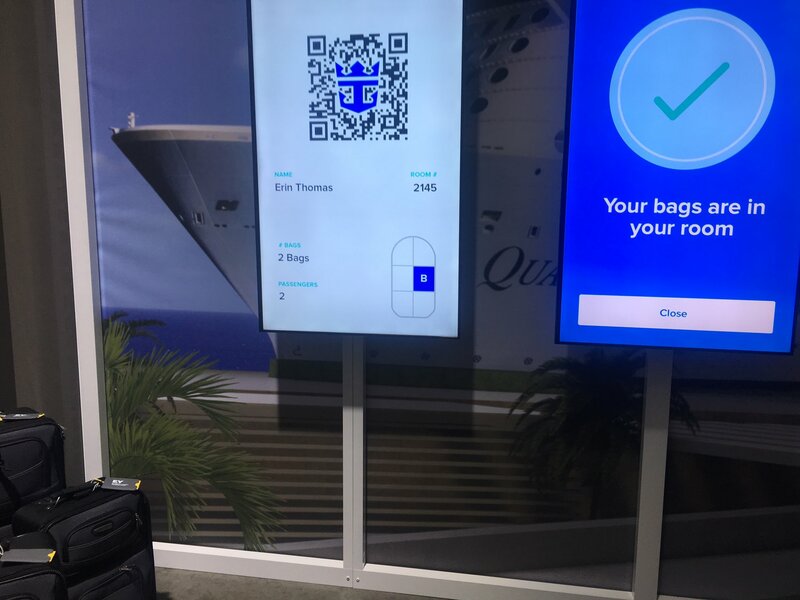 Royal Caribbean is utilizing technologies ranging from facial recognition to RFID tagging to GPS mapping to Bluetooth-enabled beacons to streamline boarding, manage check-ins automatically and improve wayfinding. This means other than the security check, there are no lines to stand in. 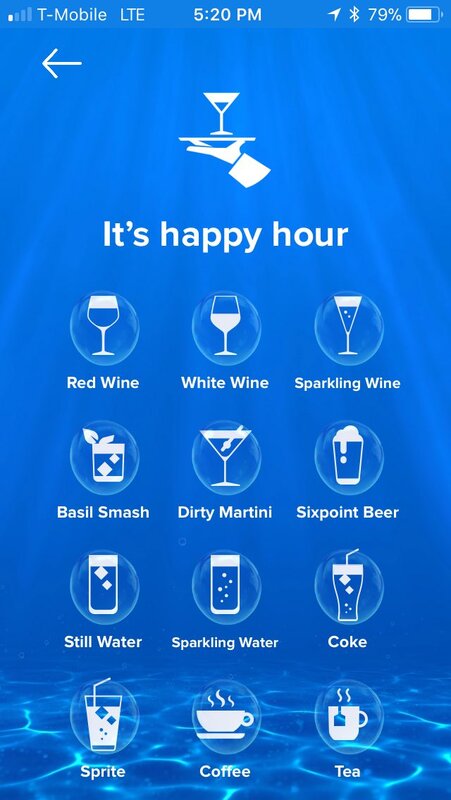 By far the most intriguing feature of the new app is the option to order beverages and have them delivered to wherever you happen to be seated or standing. You simply order the drink from the app, and the bar staff use software on their end to triangulate your position. The waiter has a photo of you that you took when you set up the app, so it is easy enough to track you down and deliver your drink. This means there is no more trying to flag down a waiter, or squirm your way to the bar in hopes of getting an order in among other guests competing to do the same. Which feature are you most excited about to use? Let us know in the comments below! UPDATE: The app has been updated again and Oasis of the Seas references have been removed. Support for Oasis of the Seas will come in "a few weeks". The latest version of Royal Caribbean's new smartphone app that is under development has been expanded to work on Oasis of the Seas. Version 1.1.0 of the Royal Caribbean App was released, which expands functionality and makes it work on Oasis of the Seas, in addition to Allure of the Seas. Additionally, the daily planner is easier to navigate, and added a daily ticker with port, weather, and sunrise/ sunset information. 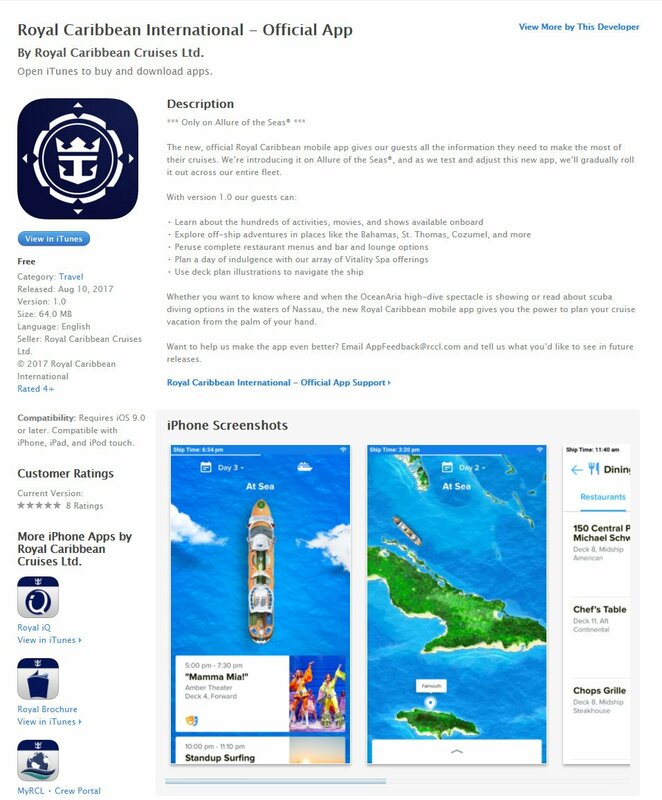 Browsing the iTunes App Store has revealed a new smartphone app that is only supported currently on Allure of the Seas. The Royal Caribbean app was released on August 10, 2017 and might be part of the highly anticipated new smartphone app promised as part of a new digital strategy refresh. 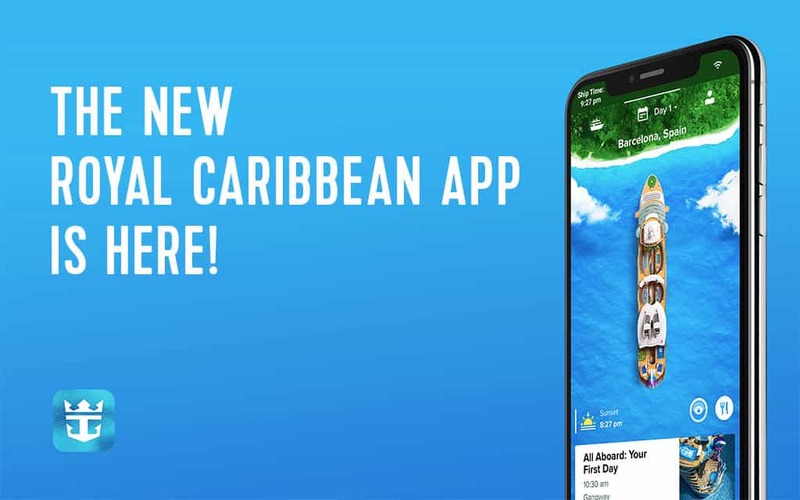 The app description describes the new app as a new, official app for the cruise line, "The new, official Royal Caribbean mobile app gives our guests all the information they need to make the most of their cruises. We’re introducing it on Allure of the Seas®, and as we test and adjust this new app, we’ll gradually roll it out across our entire fleet." Royal Caribbean has been hinting at a new app ever since Royal Caribbean CIO Michael Giresi mentioned it in an interview in January 2017. Since then, Royal Caribbean Cruises Ltd. Chairman and CEO Richard Fain has referenced it during earnings calls with analysts, but feature sets have not been divulged. Dubbed internally as, "Project Excalibur," this new app will offer new ways for guests to have a simpler experience onboard. "Starting over two years ago, we have found intuitive digital applications to make the guest experience simpler and more comfortable," Fain announced during the an earnings call earlier this year. 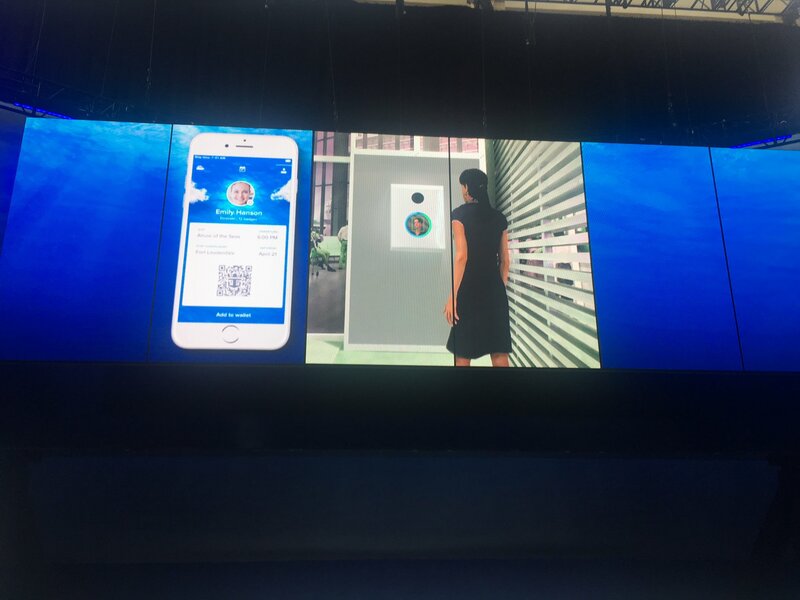 "You'll be able to open the door to your room without pulling out a card or a key, request a beverage real-time from the comfort of your lounge chair, and get recommendations for your traveling companion based on their preferences." "We take our guest vacation time seriously, and technology is a great enabler to improve the use of that." 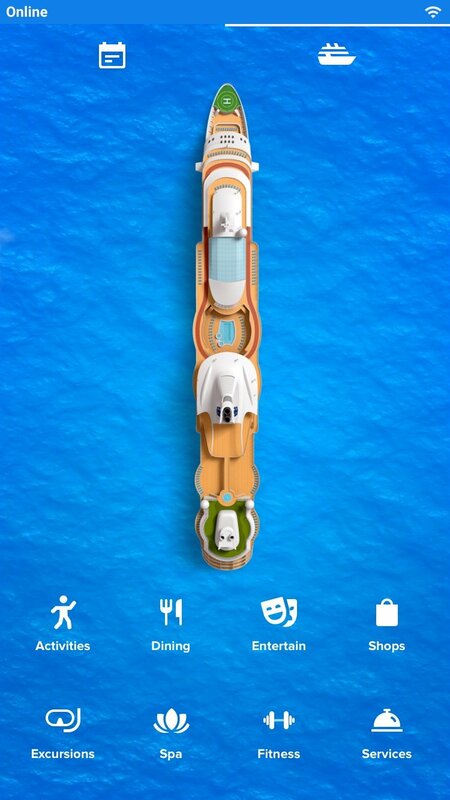 Royal Caribbean sent an update to users that its current smartphone app for iOS devices is being retired. The app was updated in the iTunes App Store on May 17, 2017, with the notice, "Unfortunately, this Royal Caribbean App is being retired and will no longer be supported. Make sure to visit our mobile experience on RoyalCaribbean.com to book your next adventure and stay informed when you're on the go." 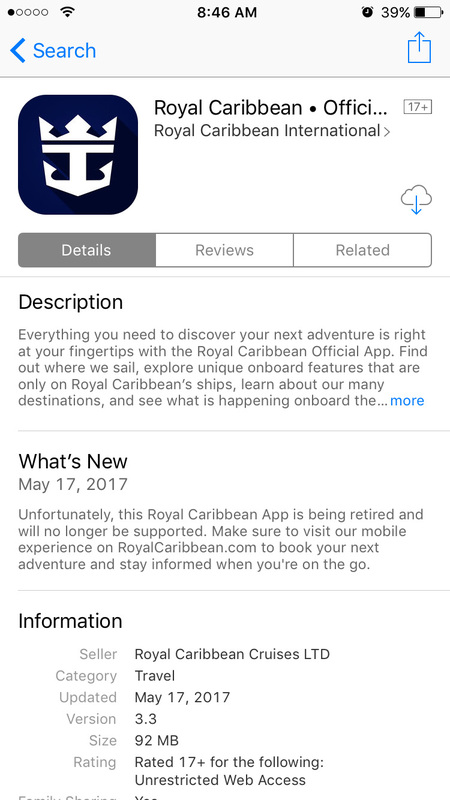 The official Royal Caribbean app was rarely updated, with just one update in all of 2016 and a few updates in 2015. 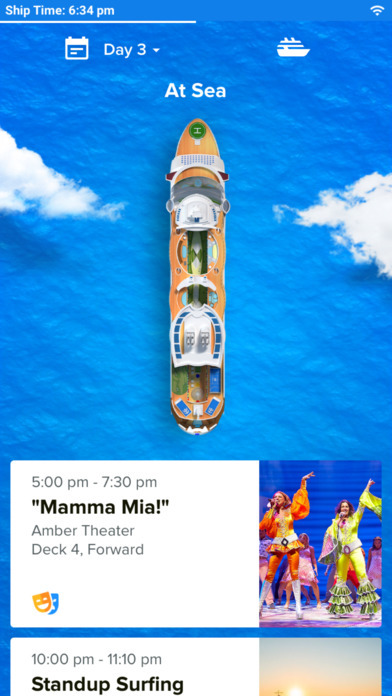 While not confirmed, it is believed retiring the current Royal Caribbean app may be the precursor to the release of the new smart phone app that Royal Caribbean is actively developing. According to Royal Caribbean Cruises Ltd. Chairman and CEO Richard Fain, the new smart phone app should be out sometime this summer. Thanks to Jason Percival Sr. and Marc Schwartz for alerting us to this app change.